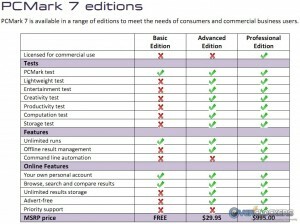 Today Futuremark is releasing their brand new full system bench, PCMark 7. The last PCMark (Vantage) was not exactly widely used in the benchmarking community. That’s not just because it isn’t a boint-granting benchmark on HWBot either. It took forever and a day to run; I think I saw a fish evolve into a lizard the last time I tried to run it. 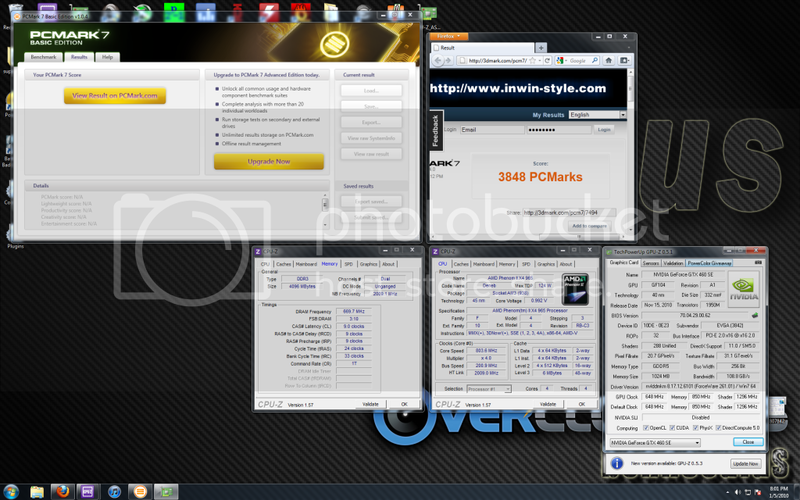 Fortunately for everyone, this iteration takes about one third the time of PCMark Vantage. Vantage could take up to 30-45 minutes to run. On the test system referenced below, it took only 13 minutes, a vast improvement! 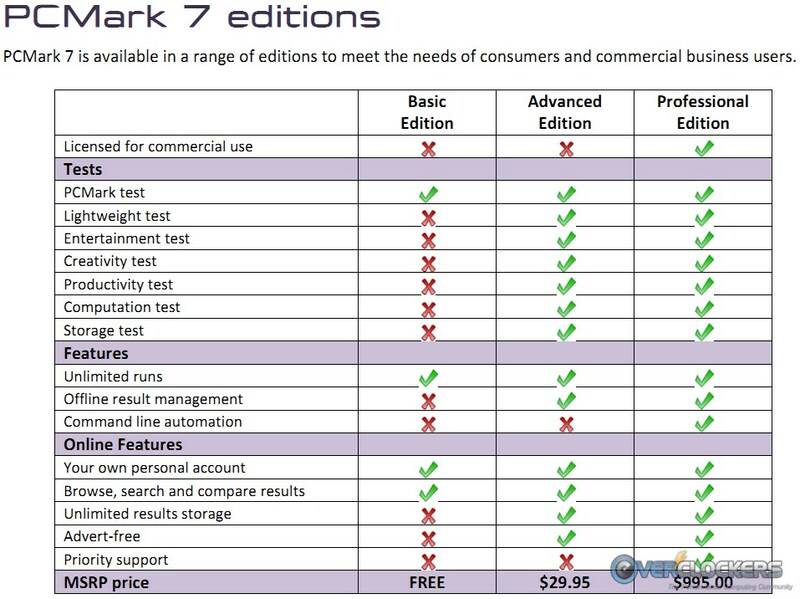 PCMark 7 comes in three flavors. The Basic edition is free and allows unlimited test runs. Unfortunately it is limited to one-stored-run at a time on the Futuremark web site. Depending on how they display results (hopefully the full result without upload), Basic could be ok for most people. The other consumer-level edition is the Advanced edition and goes for $29.95, which is pretty reasonable if you need the additional features. Test 1) Video Playback and Transcoding – This test plays a scene with taxi cabs and pedestrians driving and crossing the street, respectively. Test 2) System Storage – Gaming – None of the system storage tests are not visually appealing, you just watch the single status indicator change slowly. Test 3) Graphics DirectX 9 – This one is familiar to many of you because it was ripped straight out of 3DMark06. Remember the Firefly Forest test? Yep, that’s making a reappearance as the graphics test in PCMark 7. That one is particularly tough for GPU overclocks, so it’s a fitting addition. Test 4) Image Manipulation – This twists, tiles, flips and does other things to various images of taxi cabs and long-exposure night cityscapes. Test 6) Web Browsing & Decrypting – I’m not exactly clear which browser engine this uses. It looks like Futuremark’s own invention and does not seem to physically use the Internet Explorer browser as in past tests. All of that takes just under five minutes to run. The reason it takes the whole shebang longer is because it goes through the entire test cycle three times before giving you a score. Here’s hoping they allow single-pass scores down the road. 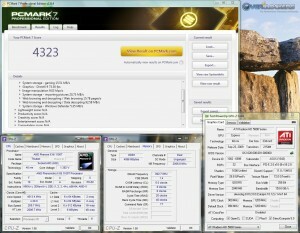 Overall, it seems like a solid benchmark and hopefully it will make HWBot at some point in its life. There is definitely an increased chance over PCMark Vantage because it has a free version and you can take screenshots with all details shown (you manually expand the test drop-down as shown in our screenshot). Total score for that system: 4323 marks. Now it’s your turn – go download the basic edition from Futuremark and show us what you’ve got! Doesnt appear to be, I ran it on my 775 system with an HDD, and on my daily driver with an SSD and it surely didn't show any MAJOR difference in scores. I could be wrong though. Edit: It did take a little bit to run, I didn't time it or anything. It's definitely MUCH shorter than PCMark Vantage, but it is longer than PCMark05. @benoc, what was your detailed score? Appears that memory speed and timings don't affect it as much, as this new run was @ 1600 7-8-7, and the previous run was @ 1333 9-9-9. I can't wait to get this chip cold and see how far it will go. I like this benchmark, there's certainly something to it. I'm curious on how to tweak it, I guess I'll figure it out one way or another. It sure seems to like raw CPU speed. Mine is 4634. I really thought I would do better than that....as for it being HDD dependent, I don't know...I run three Vertex 2s in raid 0 and as far as I can tell it uses mainly incompressible data so the write speeds are really low. Ramrod126, could you take a detailed SS showing the individual scores. I bet that RAID setup helped your score quite a bit. I bet that RAID setup helped your score quite a bit. is a high number a good thing? My bro pc. 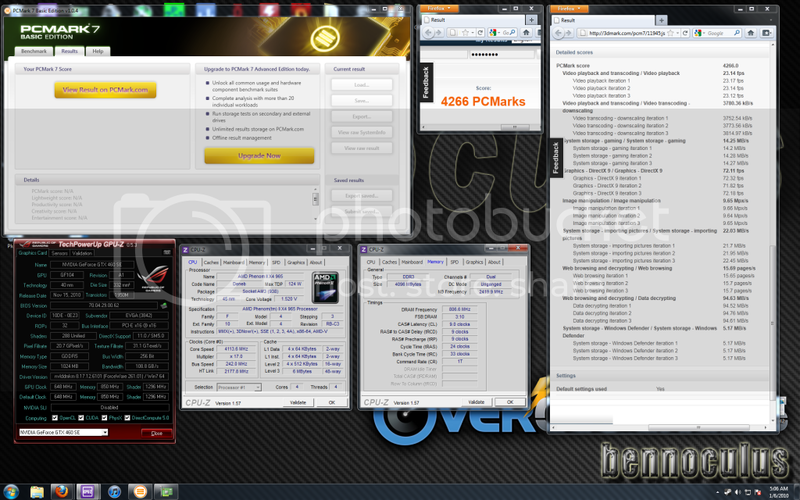 i7 920@3.6GHz , 12GB DDR3@1600 8-8-8-24, HD5850@stock, 1st gen SSD PQI 32GB for system/500GB+2TB HDD for data and he was running something in the background. Hard to say that difference is big between all systems that I saw already. 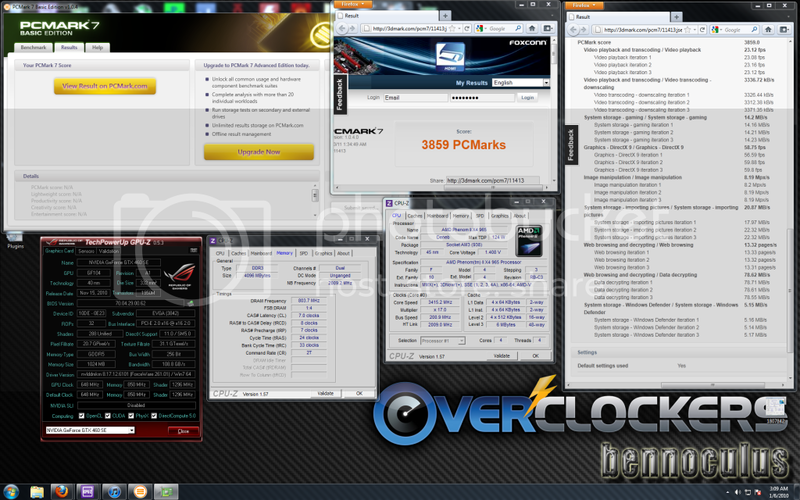 i'll bust out a bench of this on the i7 2600k superbeast tommarow and post it for you guys to look at. Should be very very interesting to see how it compares. over 5000 is a high score...lows 6's top notch.